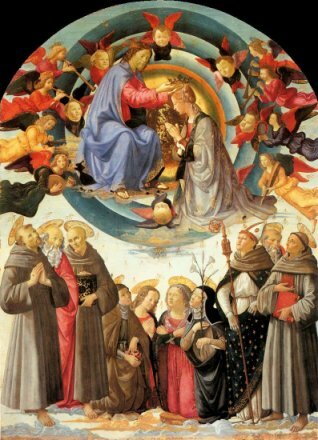 Thus said Gerard, bishop and martyr, in his homily: The heavens received this day the Blessed Virgin. 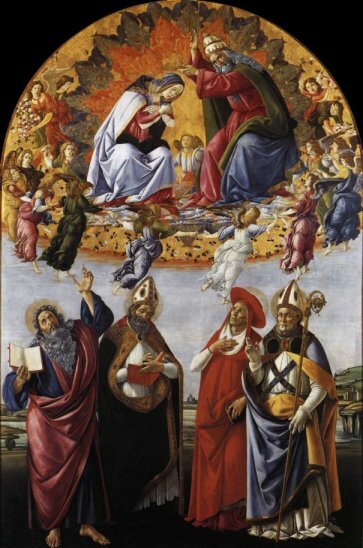 The Angels were glad, the Archangels rejoiced, the Thrones sang, the Dominions made melody, the Principalities harmonised, the Powers harped, Cherubim and Seraphim sang laudings and praisings, and brought her with thanks and praises to the throne of the divine and sovereign majesty. She was lifted up in heaven so honourably that Jesus Christ himself, with all the strength of the heavenly company, came against her. 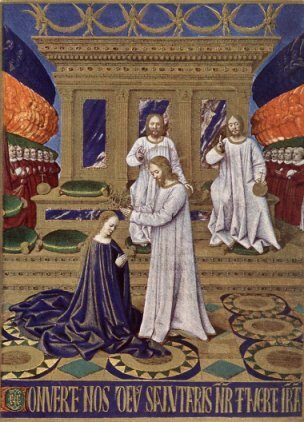 S. Jerome said: Who is he that is sufficient to think how the glorious queen of the world went up this day, and how the multitude of the celestial legions came against her with great talent of devotion, and with what songs she was brought unto her seat, and how she was received of her son and embraced with peaceable cheer and clear face, and how she was enhanced above all other creatures? 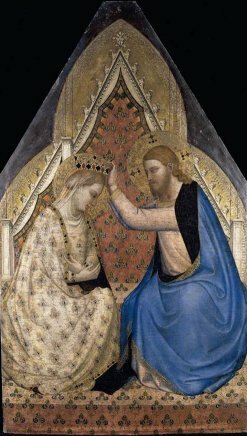 It is on this day that the chivalry of heaven came hastily to meet with the mother of God, and clothed her with great light, and brought her to her seat with praises and spiritual songs. . . . And it is believed that the Saviour himself came and met with her hastily, and brought her with him, and set her in her seat with great joy. And thus he had accomplished that which he commanded in the law, saying: Honour thy father and mother. * I'm guessing that Gerard is S. Gerardo Sagredo, one time bishop of Venice, who was martyred, some say by being rolled down a hill in a spiked barrel. A modern church dedicated to him on the island of Giudecca, a square, bunker-like building, is by far the ugliest church in Venice. The Jerome quote was in fact wrongly assigned to him, but it had a powerful influence nevertheless. 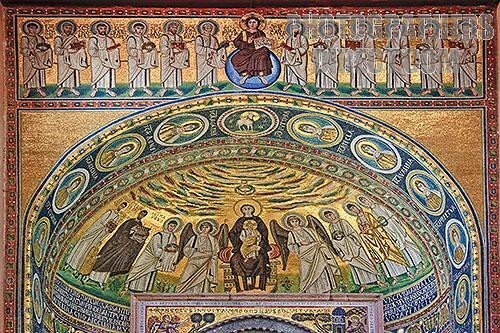 In the earliest images of her coronation we see the Coronation as an integral episode of the Assumption, with the crown coming down from above, as in this 6th century Mosaic from Euphrasian Basilica, Porec, Croatia. 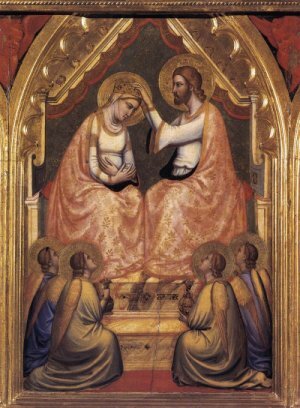 By medieval times the image of the Coronation of the Virgin was hugely popular. 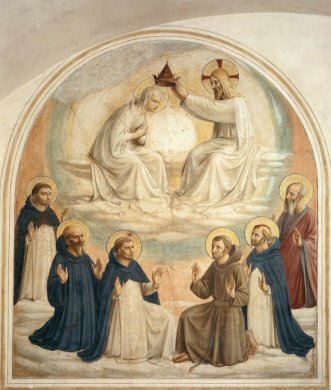 Mary was seen as already crowned, or with the crowning taking place. 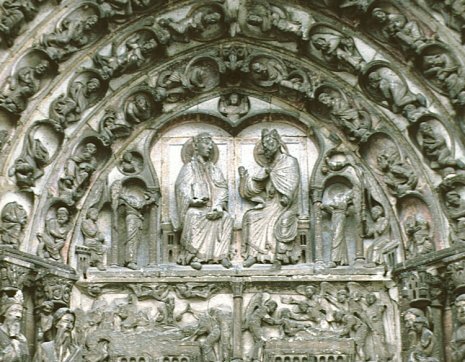 This very early example (c 1170) comes from the Cathedral of Senlis, France. 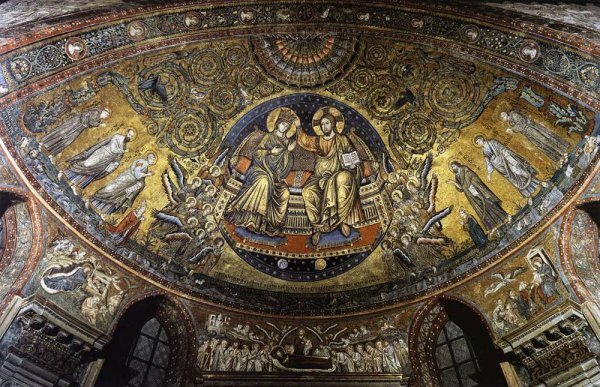 The most familiar image is that of Christ placing the crown on the head of the Virgin, as in this late thirteenth century mosaic by Jacopo Torriti in Santa Maria Maggiore, in Rome. However, there other other versions of the story. 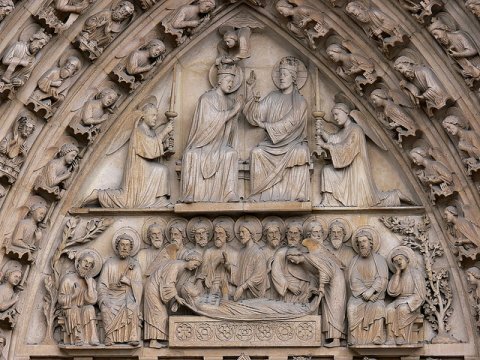 In the Tympanum from Notre Dame in Paris an angel is lowering the crown on to the Virgin's head, while in Botticelli's much later version, the task is being undertaken by God the Father. 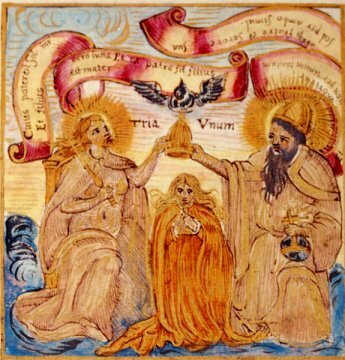 In the painting from a German MS., the task has been taken on by the Trinity. Spoilt for choice . . . 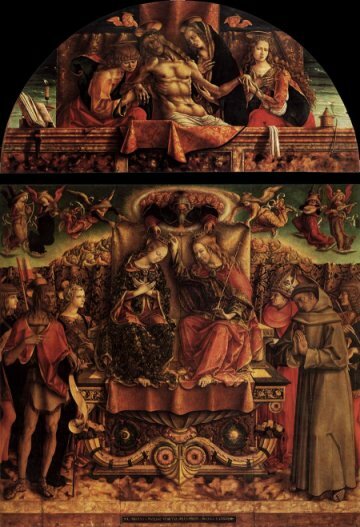 There are so many wonderful images of the Coronation of the Virgin it is difficult to decide what to include. So here are a few favourites. So that's the Coronation of the Virgin dealt with? Not quite. From my perspective, the story now moves much closer to home.